In this information age every decision one makes, it seems, needs to be validated by someone else’s opinion or somebody else’s experience. Today I’m writing about going to Judo Class. More specifically, I’m writing about going to the KBI for Judo Class. So, spare yourselves the Yelp search, and please consider my story. Here’s what you’ll likely experience if you try out a judo class at KBI Judo NYC. Probably you’ll plug the address into a maps app which will lead you to either get off the 1 train at 103rd street or take a bus to 106th street. Then it’s a leisurely walk along scenic Riverside Drive to the unique location of our dojo. 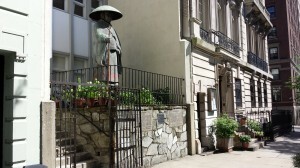 It is located in the lower floor of a Buddhist Church, nestled between two Mansion-like town houses. 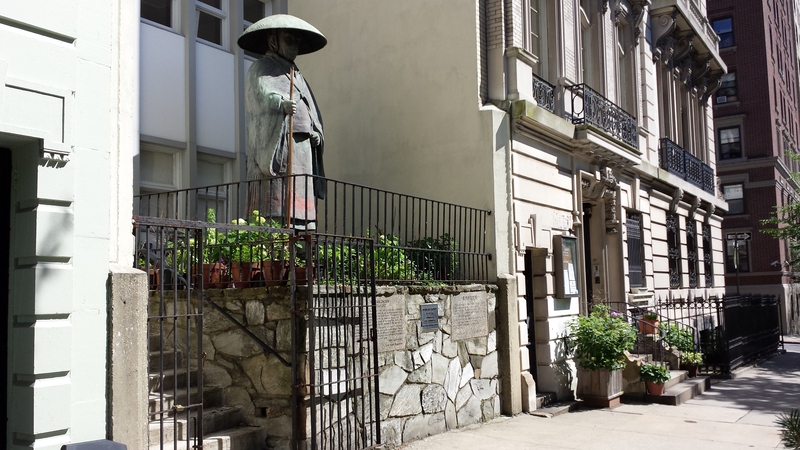 You might, for a minute, marvel at the large statue of Shinran Shonin standing out front. Then, you’ll slide the old iron gate open and walk up a few steps before entering our home. You might open the heavy door yourself, or you may feel confused and buzz the doorbell. Either way, you will enter this building just as enthusiastic and hopeful as each one of us has before. You might see me sweeping the stairs (like a master, I might add) as you enter. Then, after your descent down the plain-looking stairs, you may meet Johnny, a young college student whose sheer appreciation and excitement for martial arts leads him to get to class a half an hour early to stretch and chat with friends. 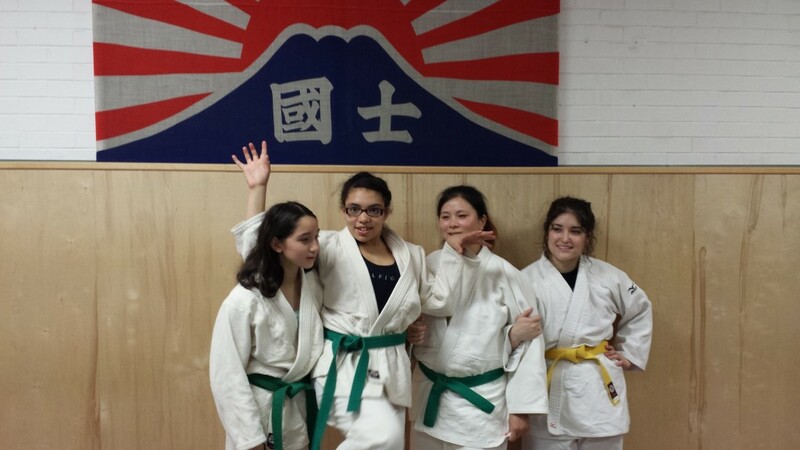 You might also see the cheerful crew of kids who will have just finished their own Judo class, and are off to go home or to their next activity. Perhaps you’ll then see Helen, a young pharmacist, laughing at a story told by Andy (our funny man). If you peer over the corner, you’ll see Sensei sitting at his desk. If you let him, he will give you the full introduction and a welcome tour. Once you’re on the mat, in your gi and belt, a variety of thoughts may arise, from “Wow, I’m really about to do this!” and “I’m so pumped!” to “I really hope this doesn’t hurt much.” Regardless of what arises, you’re about to begin your martial arts education. You’ll first stretch with everybody else. Then you’ll learn to fall – and I mean fall safely. A black or brown belt will politely and gently instruct you to tuck in your chin so as to avoid hitting your head. He or she will explain that you should not use your arms to break a fall, rather roll onto your back and slap the ground to more evenly distribute the weight and shock of the fall. After this fundamental notion of “safe falling” is taught to you, the class will most likely do 15-20 minutes of Uchikomi (technical practice). You might be surprised to find that all the belts, from white to black, are practicing together! 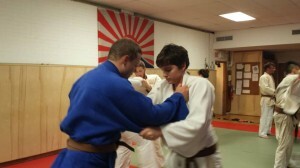 Adam, a black-belt, may be there teaching Ray, a purple belt, the different throwing techniques that he needs for his brown belt. You could be taught your very first judo technique by me, or by Thibaut or by Andy or by Ricardo. You might learn , or Ouchi Gari or Ippon Seoi Nage. It likely will feel strange at first. Your instructors will tell you that all it takes is practice, and if you believe them, you’ll already be on the right track. 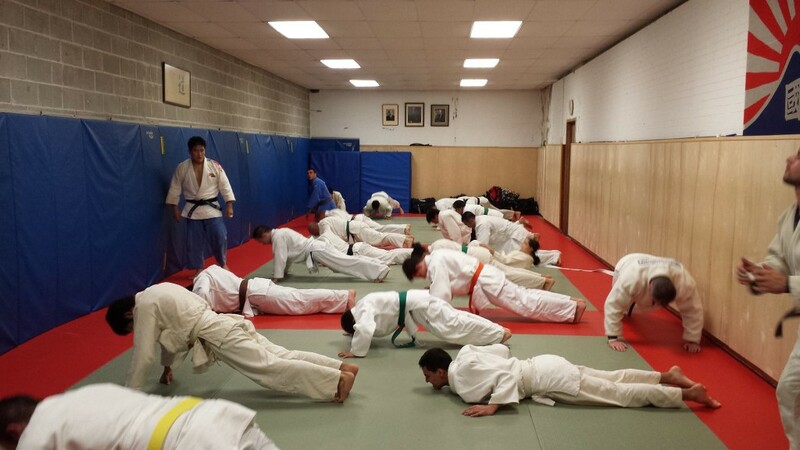 After rotating numerous times to practice with a few different people, Randori (or actual full-speed Judo time) begins. 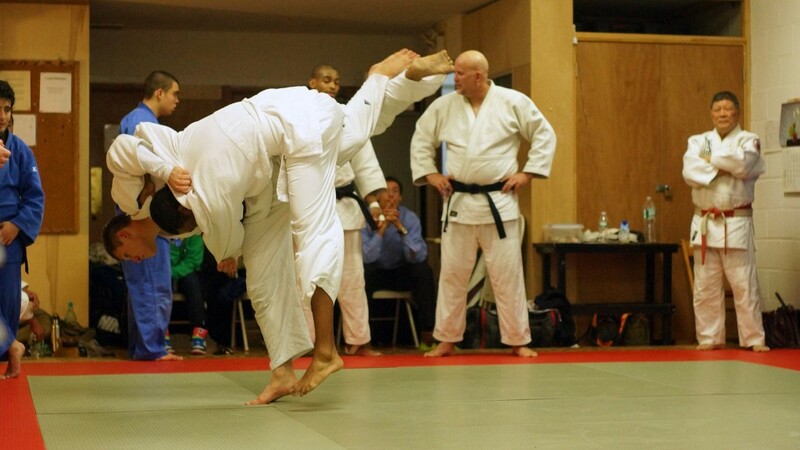 You’ll likely have your first ever judo match with a brown or black belt. He or she will let you work with your newly learned techniques, and move around so as to get acquainted with the feeling of a judo match. You might have 3 or 4 more standing rounds, and then perhaps a round or two of Newaza (Ground Grappling), where you will learn how to pin and choke your opponents (and learn how to perform all these techniques safely). Eventually class will end. You’ll probably be a little tired and more than a little sweaty. Everyone will line up for closing ceremonies and bow towards eachother including the Judo founder, Jigoro Kano. Then you will yell (or chant) the four words of the dojo creed along with all your classmates. You will then stand up, announce to the class your name, and then receive a sincere applause for having made it through your first judo class. This tradition might seem strange, but it is exhilarating. We then stand up in rank order, and form a circle of handshaking so that you may express (hopefully) gratitude towards all those who helped to teach you and practice with you. As you leave the mat, you might shake hands again with a few more people and have a conversation with someone new. Maybe you’ll get the phone number or email address of someone whom you’d like to ask more about Judo. Sensei will likely come over to you, thank you for coming by, and ask how you liked it. You might be thrilled and say “I cannot wait to come back”, or you might say that it “was a little too rough for me, and I really don’t want to get injured” (in which case Sensei might recommend Jujutsu or Aikido or any of one of our other fabulous martial arts-classes which are slightly slower paced and risk less injury). No matter your response, though, undoubtedly you will have met new people who were glad that you were there to pass time and share one of their passions. This story isn’t about me, but it could be. It could also be about you, or a friend or a son or daughter. But if this is about you, then you will have tried something new with friendly people, finished a class of it, and had the opportunity to come back for more if you so desire; and that is an invaluable experience. Judo frustrated? let it go, let it goo!! !